December 18, 2016 by DIANA H.
I love this light! We installed it in a bedroom with 9 foot ceilings and it's beautiful. It's low profile enough that you can still have 7 or 8 chain links showing with plenty of underneath clearance. Our room is a very dark color and this lights it up great. It specifies 60 watt bulbs but can alternate 40 and 60 for a not so bright look. It has a 'wagon wheel' vibe that's great for a rustic, country, comfortable feel. It hangs straight. It's perfect! The lower profile of the Griffin Chandelier makes it the perfect piece to add a dramatic touch to spaces with low ceilings. 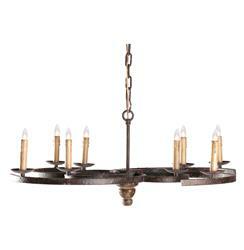 Spiral shaped Rusty Black finished iron arms extend to support eight candle lights on this elegant, spiral chandelier. This item is UL approved.